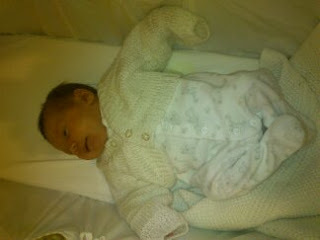 Also back in action is the sling that Auntie Fay bought when Naomi was very small. I love this sling and I am very happy that Miriam seems to love it too, Sandy and I love the look of the tiny legs sticking out the bottom, very good being little on display earlier today as the sling was used to help our over-tired baby take a nap! Lots of people have been saying to me how much Miriam looks like Naomi and I tend to agree, I thought it would be interesting to compare a picture of Miriam with one from when Naomi was small. As you can see, apart from some extra hair which is a bit darker, they are indeed very similar, definitely sisters! So, after more waiting than Jay would like, but still two days before her due date Baby II made her appearance into the world. 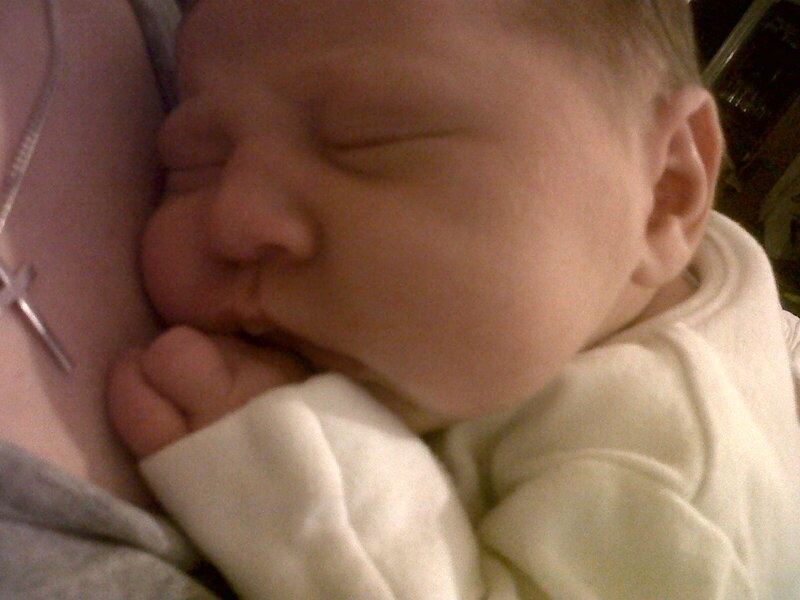 Miriam was born at 2:18am (for those who like to be precise) on Friday November 9th 2012 weighing 7lb 10oz and has already made her mark on the family. 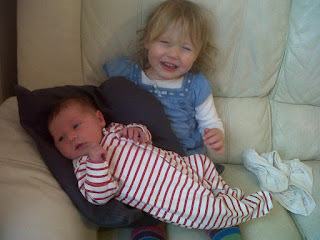 All of us, even the previously smallest member of the family, love her lots and we're all trying to work out what her various cries and squeaks mean, but (so far) she really is a chilled out wee girl who is quite happy to go with the flow and even deals well with being poked in the eye by an over enthusiastic big sister! 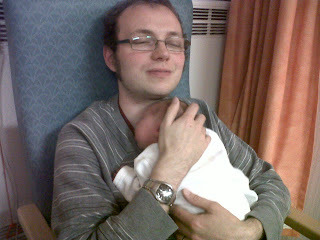 Daddy came back to visit the next day but having not got home till after 6am he was tired and proud in equal measure! With Daddy came a VERY excited big sister, this was the first time they met. Partly for her own safety Miriam now spends a fair amount of time in the Moses basket, slightly out of reach of Naomi! 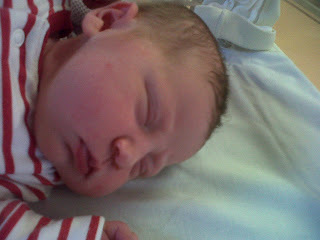 Sandy loves babies that look incredulous, here is Miriam's first effort! Believe it or not there is a baby in there! 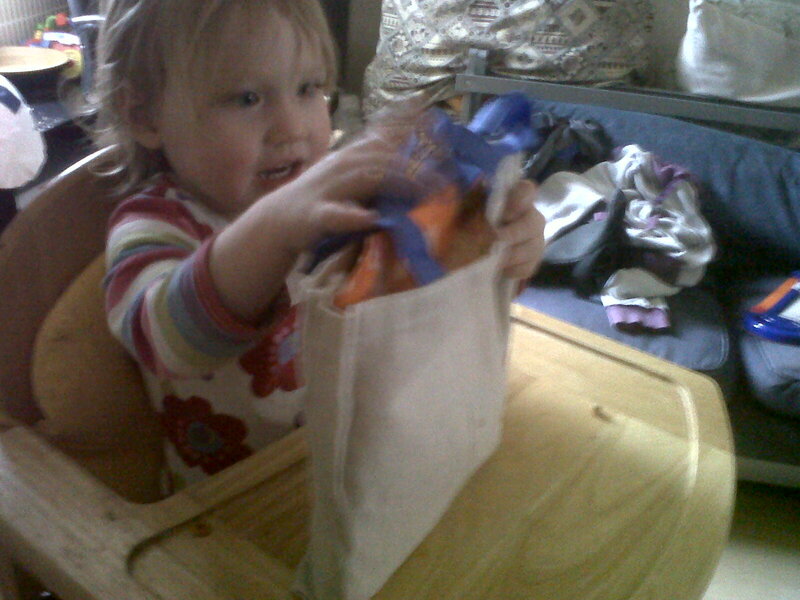 Naomi just loves trying to help, some of the time it is even helpful! 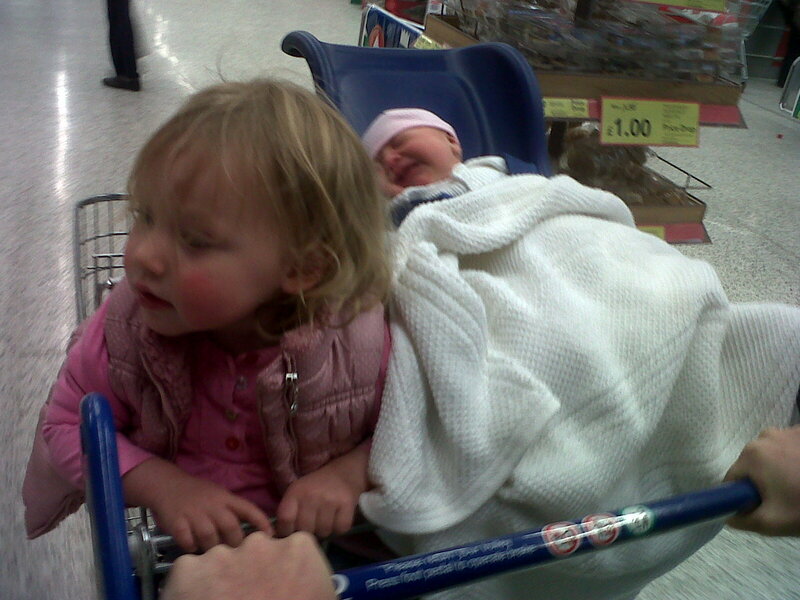 A proud big sister shows her sister off as we make a trip to Tesco, Miriam was less convinced. I fear that Naomi might be sad when the flow of presents dries up, for now she loves all her big sister presents and helping Miriam open her well-done-you're-a-baby presents. So, that just about sums up our first week. We are all tired, Naomi too, but we're working out how to be a family of four and having some fun along the way. I am very pleased that Sandy isn't going back to work till the end of next week but at the same time it will be exciting to see how it works when the children outnumber the parents while Daddy is at work. While the limbo period of Baby-II-nearly-here continues, Naomi keeps us well entertained. She's a little ill at the moment (as am I) but she's still full of energy. One of the things she really likes to do is dance, and particularly to our odd tastes in music. 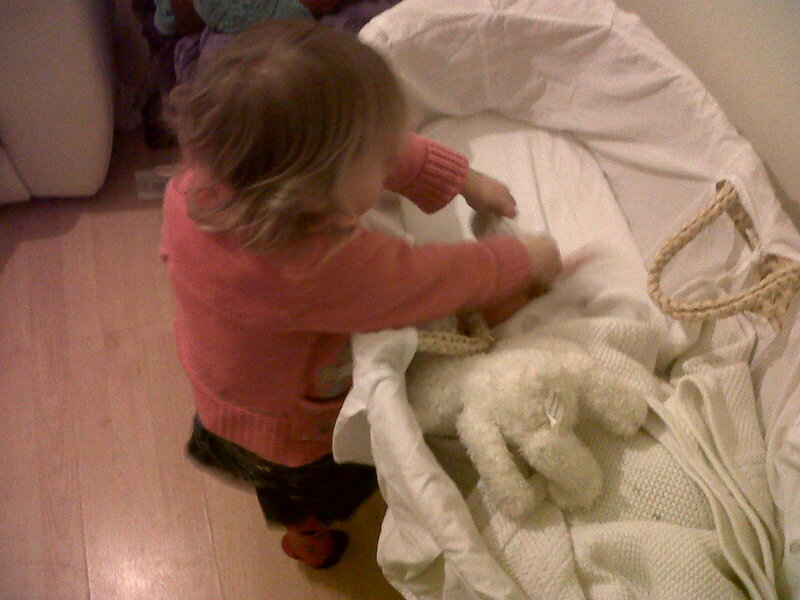 Here she is a few days ago having a bit of a ceilidh with her bear, accompanied by the legendary Shindig. As winter nears, it's even getting cold in England now! Naomi has taken to enjoying mummy and daddy's bed on the occasions she comes into our room (this is during the day when we have to get something from there, mind: she's very good at staying in her own bed during the night)﻿. She's also most particular about making sure it's quiet when this happens. She even pats my pillow indicating that I'm meant to be sleeping too. At the end of a long day at work it's hard to turn this down! In keeping with this letter that I wrote to Naomi when we were expecting her I have I have decided to write a letter to our new baby. 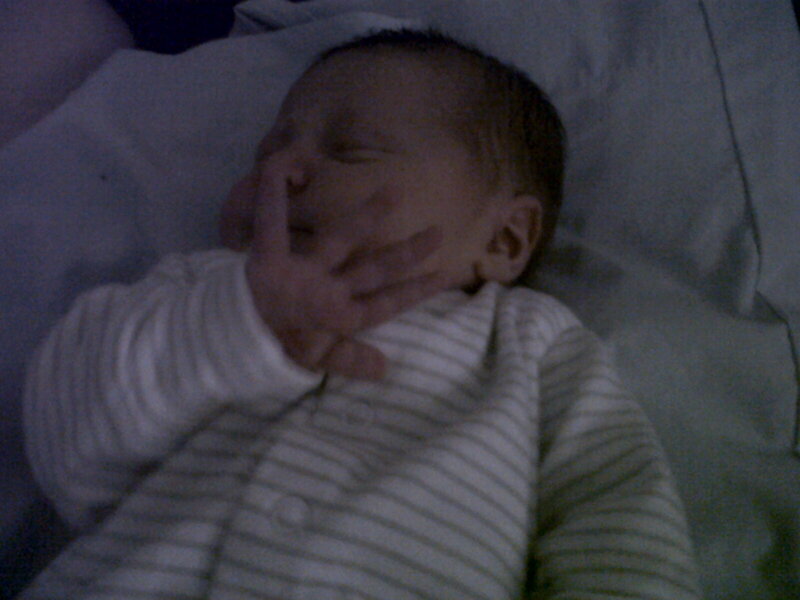 Baby Brownlee, I am already conscious that you are suffering slightly from second-child syndrome. Your Dad and I never really got to coming up with a nickname for you while you are in my tummy and this letter comes later in my pregnancy than with your sister. The thing is, though, it doesn't mean we are less excited about you arriving and it definitely doesn't mean we love you any less. I am so excited about meeting you and I already love you more than words can express. As I sit and type this I can feel you kicking me in the ribs and although it hurts quite a lot it makes me realise that you are already working out how to make your presence known, I know that you are going to be a massive part of my life and this family because I know you are going to be just incredible. I am excited for seeing what you look like, I feel like we've had a sneak peek having already met Naomi, but you will look just like you, you will be one of a kind and I am really looking forward to knowing what that is like. I can only imagine you will be beautiful. I am even more excited, though, to find out what your personality is like. If the old wives' tail is to be believed and the temperament of a baby still in utero relates to the child that baby will become, I think you will be quite calm and chilled out (which having been dealing with your big sister for nearly two years now I am not sure what that looks like) and I suspect you will be quite contemplative. It's up to you, though, baby. You can be whatever you want. God will have woven hopes and dreams and desires into you and you can follow those as you want, I will consider it a privilege to help you work out what those things are. Baby, you will be beautiful, I am sure. You will be incredible, I am sure. You will steal my heart, I am sure. I can't wait to meet you. Come and meet me, it's great out here, we have milk and cuddles, these things are brilliant and we have your big sister, she is also brilliant. Hope to meet you very soon, indeed! We now have fewer than three weeks till our due date! All preparations are almost done so it is just a case of waiting for baby to decide to make an appearance. When we were still expecting Naomi we ran this competition and thought we'd run another now. As with last time the only prize is the joy of winning. So, we're looking for your predicted date of arrival, weight of baby and of course gender! Due November 11th and for those that think these things matter here is an up-to-date picture of the bump! My parents came down a couple of weeks ago to look after Naomi, so Jay and I could have a bit of a break before the new baby comes. This was the longest Jay had been away from her (2 nights!) and was pretty hard, but the weekend was very nice. The room was very warm given the time of year :( Fortunately the place had a pool and jacuzzi which were much appreciated. Naturally we went for a short walk in the Peaks, and on the advice of my supervisor Jon we did a lovely walk that lasted about an hour and a half, concluding with one of the very English pubs that seem to cover this part of the world. View from pub. Note hot air balloon. All in all a very enjoyable weekend. Grandma and Granddad had a nice time with Naomi (who enjoyed having more people to show off to), and they were here for over a week in total. Most fun.